Have you ever wondered whether you can have ice cream on keto? Well, I don’t blame you. Ketogenic diets can be boring and tedious if you do them for long amounts of time, so who wouldn’t look to something delicious like ice cream to delight those tastebuds! The answer to whether you can have ice cream on keto is; it depends. More traditional forms of ice cream are relatively high in both fat and carbohydrates, which makes them unsuitable for a keto diet. Not all hope is lost however, as there are options for you to choose from. Firstly, it’s important to understand what keto really is. Whether you’re following a ketogenic diet for weight loss, a medical condition or other reasons, the primary challenge of this diet is keeping your body in ketosis. You’ve undoubtedly heard of ketogenic or low carb dieting. In recent years, they’ve been all the rage for melting your body fat and staying healthy. The Atkins Diet? The Dukan Diet? All forms of low carb dieting which take advantage of having low carbohydrates in your system. When your body is deprived of its main energy source – carbohydrates – it starts to use fat for fuel. Essentially, you can think of it like this. Currently, you use carbs as your fuel to get you through the day. If you restrict your carbs completely, then your body needs to find another energy source to get it’s fuel. So, your body looks to the fat in your body and utilizes that for energy instead. It’s like switching your car from using petrol (carbohydrates) to vegetable oil (your blubber). Anyway, using fat in the form of ketones instead of carbohydrates is only possible if you significantly restrict your carbohydrate intake. This means that you have to restrict all foods that are high in carbohydrates and sugar like bread, pasta and typically ice cream. Whilst ice cream isn’t extremely high in carbohydrates, it usually has too much sugar to be considered as a part of a keto diet (unless you plan on having like one scoop, and who has that kind of willpower right?). While some people follow varying restrictions, the general guideline to stay in ketosis is a maximum of 50 grams of carbohydrates a day. Some ketogenic diet plans have more severe restrictions and may limit your carbohydrate intake to 20 grams per day. When you follow this kind of plan, it’s important to read labels and understand where you find carbohydrates in your food. Since the average person gets at least 50 grams of carbohydrates per meal, you’ll have to be vigilant. So.. Can I have ice cream on keto or what? If you enjoy ice cream and are following a ketogenic diet, then it’s going to be difficult for you to have this treat. If you limit your portion to a ¼ cup serving, you may still include it in your diet. A regular ¼ cup of vanilla ice cream has around eight grams of carbohydrates, so you could usually include this in your meal plan. But, it’s not ideal. Choosing this as a treat may limit healthier types of carbohydrates like vegetables, which include important nutrients. For this reason, we can probably say that regular ice cream may not be your best option if you want to eat ice cream on keto. Though don’t worry too much; all hope is not lost! Sugar free ice creams are often part of a ketogenic diet. These will have much fewer carbohydrates in most cases so you can have a larger serving without breaking your diet plan. Sugar free ice creams were originally designed for those with diabetes, but they’ve now become extremely popular as a choice of dessert for dieting addicts. I feel like I should add that you’ll want to check your sugar free ice cream, since they contain sugar alcohols. These sugar alcohols may give you some uncomfortable side effects, and they may cause bloating and diarrhea. Sugar alcohols, like Maltitol, are commonly found in sugar free products so if you eat a lot of sugar free stuff already and haven’t noticed a difference, you’ll probably be fine. Though there are a lot of people who seem to have issues with sugar alcohol, so just be aware that they may cause disturbances (I’m trying to put it politely!). Another choice that is probably your best option is specially made low-carb ice cream (which may also be referred to as keto ice cream). Keto ice cream is a good option as it is made from heavy whipping cream, which usually only contains a few grams of carbohydrates in a cup serving. To add a sweeter flavor, there will be fruit or cocoa in some varieties. Some kinds will also have oil added to increase the fat content, or egg white powder to increase the protein content. Keto ice creams have become increasingly popular over the last few years, so there’s more options around if you’re looking for a delicious one. However, there is still a gap in the market for keto ice creams and there aren’t as many options as I’d personally like. What are the best ice creams if you’re on a keto diet? In my opinion, the best options come from So Delicious. They have loooooads of options for ice cream, and a lot of their products are ideal for those that are gluten intolerant, dairy intolerant and perfect for those that want to keep their sugar count. Check out this review for a closer look at their sugar free ice cream. Although Unnatural Vegan doesn’t like it, she’s super picky and doesn’t really like anything. It’s pretty tasty, in my opinion. Another of my favorite options for a low sugar ice cream is Halo Top. I’ve actually seen that they’ve increased the amount of sugar in their ice creams over the last few years which is kind of annoying, but I’d still advise checking out some of their options if you’re after a good choice of ice cream for a keto diet. Keep in mind that while keto ice cream is available, it may not be as sweet as regular cream. Most people notice the richness and enjoy the texture, but it isn’t for everybody. You know that this choice is a good one when you have a craving for a sweet treat, but don’t want to cheat on your diet plan. Another thing I should probably add is that if you can’t find any good choice of keto ice cream in your area, then you can always consider making your own! 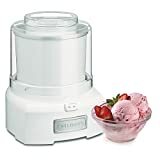 There are a variety of recipes that are easy to use and don’t require an ice cream machine to make, though it’s usually a lot easier if you get yourself a good quality ice cream maker to make your ice cream in. You can find tons of recipes online that you can use to make yourself some delicious keto ice cream; this one is my favorite! Although being on a ketogenic diet can be challenging long-term, you can still enjoy some of your favorite foods in moderation. Ice cream can be a part of a ketogenic diet with either a small serving of a traditional ice cream, or a modified version like a no added sugar ice cream.